A dazzling brilliance and soft colours ranging from pale pink to a lovely warm peach. Morganite is a gem that is much in demand, it has a dazzling brilliance of soft colours that ranges from clear pink to a lovely peach. With a hardness of 7.5, Morganite is a durable gem perfect for everyday wear. 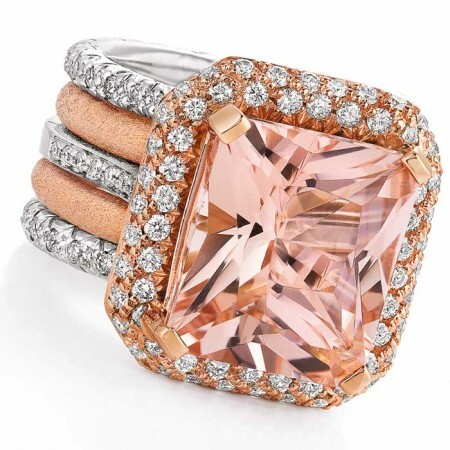 Morganite was first discovered in California in the early twentieth century. Morganite was an exciting new discovery, one that drew the attention of the world’s most important gem buyers. Morganite is occasionally found in large sizes: the largest faceted Morganite is a 598.70carat cushion shape from Madagascar in the collection of the British Museum.